If you’re thinking about going to college, you have to think about how to pay for it. Rising college costs are impossible to avoid. Everywhere you turn, there’s another horror story about how much debt ordinary people got into just trying to get college degrees. The average borrower ends up with $27,000 to pay back after graduation. And unless you’re planning your education so you inevitably land in a high-paying industry, you’re likely to have student loan debt hanging over your head for way too long. Don’t want to take any chances? If you want to avoid student loans at all costs, there are ways to pay for college without taking out loans. 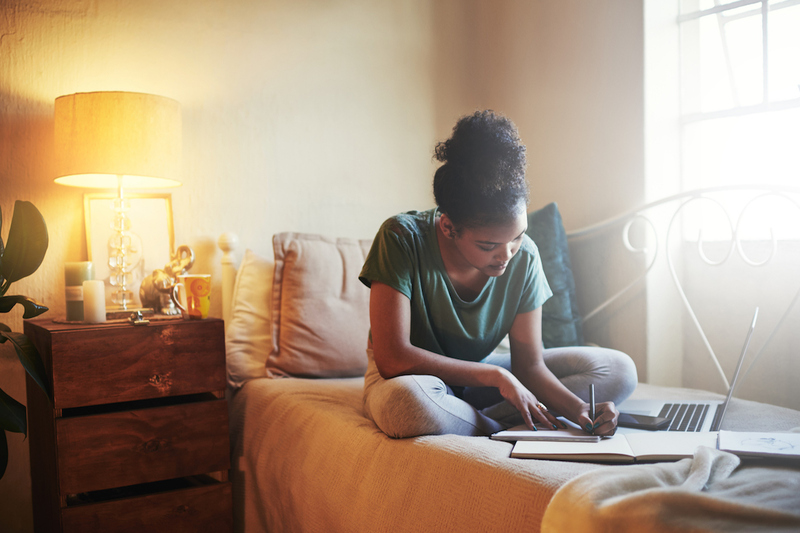 We’ve collected 15 ways to pay for college that you can think about — first when you’re narrowing down your college path and again once you’re settled into your campus routine. I’ve heard all the excuses for why you don’t want to apply for financial aid. You think your parents make too much money. You want to go to an expensive school, so the Federal Application for Federal Student Aid won’t help. You’re afraid of what the FAFSA will say you should pay for college. Stop with those excuses. You need to fill out the FAFSA. The application is easier than ever (promise! ), and most schools require it to consider you for financial aid of any kind — whether it’s need based, a merit scholarship or work-study. The FAFSA also determines your eligibility for Pell Grants, which unlike loans, you don’t have to pay back. If you don’t apply, you miss your chance to essentially get free money for college! The estimated family contribution (EFC) amount the FAFSA spits out after you apply can be scary, but remember, it’s just an algorithm. You’ll get a financial aid package from the school you choose that spells out your financial aid options and what awards are available to you. Low-income students may be eligible to apply to college without paying application fees. Work with your high school guidance counseling office to submit your fee-waiver application to the schools that interest you. Some colleges also offer application fee waivers if you take a campus tour. If you’re traveling to visit colleges, don’t waste your time by wandering around in the back of the tour group. Ask smart questions. Tour guides and campus ambassadors will be ready to tell you how they found a job, scholarships or internship opportunities. And if you simply ask, “How are you paying for college? Do you have any advice for me?”, the odds are good they’ll spill the beans. If you’re a high school student, the idea of saving money versus spending it with your friends on the weekends probably sounds like a total bummer. You can still ask for cash for your birthday or the holidays, but consider asking for those contributions to go to a 529 college savings account in your name. Withdrawals from this account are tax-free as long as you use the money toward real college expenses like tuition, room and board, or equipment, although restrictions vary by state. Community colleges have long held the stigma of being for students who couldn’t get into a four-year college. But they’re a great place for working adults, nontraditional students, college students with undeclared majors and people who just don’t want to spending a ton on a solid education. The average annual tuition for a full-time community college student is just $3,430. The average yearly tuition at a state school? $9,400. Doesn’t community college sound like a good investment for those prerequisite courses everyone has to take in their first two years? When it’s time to work on your bachelor’s degree, many schools offer transfer scholarships — and some even cover full tuition for a few students each year. In-state discounts may not be as dramatic as they used to be, but going to a public school in your home state can shave thousands off your tuition bill over four years. Some companies offer tuition assistance; the really awesome ones even offer it for part-timers. Starbucks reimburses employees who take courses through Arizona State University online — regardless of field of study — while UPS part-timers can receive $5,250 per year in education assistance. Juggling work and school can be hard, but it’s a little easier to roll out of bed for an early shift when you know you’re earning extra toward your education! A bit of sleuthing can turn up big rewards. Once you know where you’ll attend, check with your major’s department, the career center and the financial aid office to find scholarship and grant opportunities. Some campuses offer scholarships or grants for new and returning students based on highly specific criteria, so they don’t get advertised as much as major awards with wide eligibility. See an interesting scholarship you might be eligible for in the future? Mark a date on your calendar to check back in! Various organizations provide scholarships to students, and these awards can make a big dent in your tuition bill. The application process may be tedious — sharpen your essay writing skills! — but for every application that requires two essays, transcripts and a recommendation, there’s another that requires a tweet-length personal statement. Don’t forget that scholarships aren’t just available for rising freshmen. Many are also available for upperclassmen, and some scholarships offer renewals if you keep your grades up. Once you set your semester schedule and sharpen your pencils (do college students even use pencils anymore? ), keep an eye out for these ways to keep your college bill low. You can often use financial aid, whether in the form of grants, scholarships or loans, for supplies. You should never pay full price for new books anyway, so dig around to see how you can save on books – or get them paid for entirely. The best thing you can do in the first few weeks of freshman year? Set up a meeting with your financial aid office. Get to know the people who work there, and show up on a regular basis — once or twice a year, maybe — to check in. It can be as simple as setting up a regular appointment to review your file and make sure you’re not missing out on any opportunities for aid or awards. Bonus: Knowing your financial aid counselors can come in handy if you ever have an issue and need a question answered quickly. Living in the dorms is fun, but the bill can add up fast. Consider alternative housing arrangements, whether you choose to live at home, commute to campus from a group house or maybe even apply for nontraditional campus housing. Did you know some colleges will pay you to graduate on time? We’re not saying to rush through your coursework to get out the door in exactly four years. But if you’re already on track to graduate “on time,” you might be able to get a few grand back to put toward any remaining college expenses. Work-study jobs aren’t always glamorous. Most of them don’t pay much, and you can only work a certain number of hours per week. So why does anyone tick the box on their FAFSA to be considered for federal work-study jobs? Because it’s money! Income of even a few hundred dollars each month can prevent you from charging everyday needs or using your emergency fund for presentation supplies. Work-study jobs are often filled quickly, so stay on top of your school’s career center or work-study website for details. A bad commute to a so-so job can really put a damper on your hustle. If you’d rather work from the comfort of your own dorm, consider a part-time remote position. Self-starters — especially those skilled in writing, design or customer service — are a particularly good fit for remote positions. Your Turn: What interesting ways have you discovered to help you pay for college?